If you've ever needed a quick fix of GDP (or any other such data) to go, World Bank's new DataFinder app should help... Once it is available (early April), you'll be able to access, graph, and share World Bank data whenever you need it, right on your iPhone. Get more details from Sameer Vasta's post at the World Bank blog. Reminder to students: Class tomorrow on "Law and Governance- Doing Business in China"
My class will be on "Law and Governance- Doing Business in China", from 6pm-8pm at Haas Haas Cheit C250 tomorrow 3/31. Ps. Registered students, please visit the Haas school wiki using your CalNet ID for the reading materials and case study we will be using, if you have not already done so, and be prepared to share your experiences as well as your thoughts about the case. We utilize survey data from over 11,000 firms operating in 125 countries and a profit-maximizing cost-benefit framework to study the determinants of procurement bribery. About one-third of firms bribe to secure public contracts, with an average bribe of 7.9% of the contract value. Econometric estimations suggest that the demand-side of good governance (voice and democratic accountability, press freedom, transparency) and the supply-side (rule of law, government effectiveness), along with competition, significantly reduce the incidence and magnitude of bribery by firms. Multinational firms appear sensitive to reputational risks in their home countries, but also partially adapt to their host country environment, with 20% bribing in middle- and low-income countries, but only 11% bribing in OECD countries; in contrast, 36% of domestic firms bribe. Larger and foreign-owned firms are less likely to bribe than smaller domestic ones, yet among bribers, foreign and domestic firms pay similar amounts. This suggests that reputational risks – affecting the decision to bribe, not the amount – are important. The results point to potential policy measures that raise the costs and lower the benefits of bribing, e.g., public disclosure of firms that bribe, and cast doubt on conventional initiatives that may not affect profits, e.g., voluntary codes of conduct. I will be attending this 5th (?) #ICT4D Chat tomorrow, and will update this post with the chat summary when it's available. We used to do this on twitter but our Nigerian partners have requested a chat on skype instead. Are you interested in Internet-based business opportunities in Nigeria? Wondering what the possibilities and challenges are? And if Ghana, Kenya, or another African country might have a better online business environment? What are the online business opportunities in Nigeria? Are they greater than in Ghana or Kenya? How can Nigeria regain or extend her lead in online business? Technology Salon, a face-to-face forum for development and technology professionals which was started by a colleague and friend Wayan Vota in DC, was for the first time held in San Francisco this morning. I was happy to be part of the San Francisco Bay Area group of ICT4D folks who discussed about mobile phones in developing countries. It always thrills me to be able to talk honestly about technology in developing countries, as well as get to know more people who are interested in this niche, and often misunderstood, field. Today's presentation was by Terry Kramer, now Regional President - Vodafone Americas, on the current mobile industry and its implications to the developing world. Official announcement is here. History of the mobile industry (Terry had a great intro slide that, if I can find, I will link to- it shows the 'old' brick like mobile phones of the early 90s, and brought me into a mood of nostalgia for the times when I still felt smarter than my phone). But especially in the developing world, all these 3 things depend a lot on government licensing policies, legal and policy framework for ICT, bureaucratic processes, and level of transparency/corruption. These are usually slow and problematic, entrenched in deep governance issues. Globalization means that First World needs to learn from 3rd world as well (eg for Vodafone, UK looks to India for their solutions for keeping costs down); This is a change in paradigm in the mobile phone industry, which like Development, started with the 'we will import our technology to the 3rd world, one way'. Many new and innovating ways to use mobile technology through applications for developing world, such as mHealth Alliance, just at tip of iceburg of opportunities, most important is the issue of 'scale', because increased scale drives unit costs down, so important question for project designers: what projects can scale? Vodafone Foundation looking for such projects to fund via its Wireless Innovation Project. Recently, I was updating my own 'law and development' syllabus and called some colleagues and friends to try to find out what the state of that teaching is. I'm impressed at the diversity of courses that are focussed on 'law and development', and the different areas of emphasis. It goes to show that this is indeed a very broad field with many levels of entry. So far, these are the professors, schools and courses I am able to compile- you can google most of these to find the syllabus online. I hope to make this a live working file in the near future so that collaborators can update it anytime. While his interest in 'broadband' is passionate, his political message was more key. It does remind me of many government 'IT' champions in developing countries. His claim that Vermont can go 'From Worst to First' because of Broadband, I question if it is too simplistic and reliant on leapfrogging technology (there was not much mention about the non-technology issues that often, if not always, overwhelm the technology). Last Mile State, very rural, spread out states, "dead last in internet connectivity"
How Vermont can leapfrog a technology generation and lead the nation in connectivity, transparency and innovation. Vermont is currently the least connected state in the country and has been ranked among the bottom three states for government transparency and use of the Internet to deliver services. Yet, the state’s size and tradition of participatory government may make it the perfect state to model fiber to the home, distance learning, new economy jobs, smart meter deployment, electric car grids, and active 2.0 engagement in state government that could approximate town meeting. Matt Dunne, former State Senator, Head of Community Affairs for Google and current candidate for Vermont Governor will share his vision for Vermont becoming the first truly 21st Century state. Matt Dunne has focused his life’s work on bringing together the worlds of entrepreneurship, service and politics. Elected to the Vermont House at the age of 22, he served 7 years before joining the Clinton Administration as the Director of AmeriCorps*VISTA overseeing 6000 full-time people working in the fight against poverty. In 2002 he returned home to Vermont and was elected to two terms in the Vermont Senate. Outside of the legislature, he worked in high-tech marketing and before joining Google was the Associate Director of the Rockefeller Center at Dartmouth College, creating programs to support students who wish to pursue careers in the nonprofit and public sector. Now the Head of Community Affairs at Google, Matt supports the company’s local corporate social responsibility activities in the 25 communities where Google has an office or data center as well as helping guide larger corporate partnerships with the nonprofit and public sector. These activities include assisting the company with directing carbon offsets and renewable energy investments, and using technology to increase energy efficiency. Matt currently lives on the small farm where he grew up in Hartland, VT with his wife Sarah Taylor and his sons Judson and Abraham. The Justice and Development Working Paper Series serves as a platform for new and innovative thinking on justice and development, featuring work from World Bank staff and external authors. It is a knowledge product of the World Bank’s Justice Reform Practice Group, which generates knowledge and provides advice and assistance to Bank staff and Bank client countries on building and improving state and non-state justice system institutions and mechanisms. Justice and Development disseminates the findings of works in progress to facilitate a more rapid exchange of ideas about development issues and justice reform. Justice and Development seeks original research papers on law, justice and development. We welcome publications from both Bank colleagues and external contributors. Manuscripts must be in English, and no longer than 25-30 pages. They can be submitted to the Editorial Office at any time of the year. All submitted papers will be carefully reviewed by the Editorial Board. Criteria for selection include rigorous scholarship and innovative approaches related to law/justice and development. If you are interested in submitting a paper, please call +1 202 458 2950 or email: mayano@worldbank.org. You can access these papers (and others in future series) here on the World Bank website. Given my recent update on the current thinking on Law and Development, I was interested to hear that Tom Ginsburg and his team at Law And Development Blog were holding their first ever online Symposium on the Future of Law and Development. 1. Is Law and Development really a field, both in practice and especially in academia? 2. What are the lessons learned about the topic? 3. What should be our academic and applied future focus? The responses of these prominent scholars (some of whom are also practitioners) confirms my own thoughts on this subject in practice and study- that it is still an evolving, broadening field that is compounded by the fact that there is so little agreement on what is meant by 'development', 'law' and 'impact'. Here is my summary of the wide array of responses to the three questions. Yes, the practice of 'law and development', 'rule of law', 'legal reform', etc, although disparate activities, shows that there is an inherent value of the virtue of law. Taken as a value, rather than a project activity, it can promote a unity of purpose. No, it is not a field it itself, it might be more a common focus of multiple activities/disciplines/fields. Even within 'law' itself, narrow subject based law implementation has a totally emphasis than, say, the way broader 'rule of law', whatever that means. However, 'legal development', a very narrow construction of law in development, might be a field. Maybe, but I don't care to debate it because we can argue until the cows come home.Although such theoretical questions are common in academia, it is not productive. It remains very hard to show that law causes development, compounded by the many definitions of 'law' and the many definitions of 'development'. Arguably it might be easier to study a concrete narrow application of law (such as telecoms law) on economic growth, than say a broader 'legal reform' project. Moreover, the few studies that have been done to explore causal links have been flawed in definitions, assumptions, method, or data reliability. We need to do the impossible and define what 'development' is (including what the end goals are), that 'law' is trying to serve so that we can actually measure the impact of that law project. And even then, 'impact' might not be possible to measure or be debated because we all look at it from our individual different lens. In particular, we should continue to refine out knowledge of law and economic growth, as well as law and social development, based on practice by aid agencies. But, as an academic field, how much should we take into account the current practice of aid agencies? However, we should also study law more broadly in terms of scholarly and more theoretical issues like adoption, integration, governance. It will become more and more of a social science, then a legal or economic, field. Maybe it is not possible to theorize such a field. And even it it is, as a social science, it is even harder to measure and study. Accept the differences in practice between the different aid agencies (based on their realities) rather than try to find universality, and examine the social, cultural, political and ergonomic contexts in each study of the topic. However, while studying the contexts is useful, how can we strike a balance between 'context matters' (ie highly tailored one-off solutions) and the 'blueprint approach', both of which are not particularly useful in practice? This is very hard to answer, but maybe scholars can can first develop methodological tools, define 'development' and the goals of each context, admit complexities, and develop theories. While studying the subject, we should include the usual quantitative methods, but give qualitative methods just as much, if not more, importance. In addition, we should study legal approaches in development using diverse and interdisciplinary methodologies. Moreover, we should study 'law' broadly to include the informal systems and unique context of each country. I saw Donnie Hao Dong's presentation about a 'Splitting Internet' today at Berkman- about the internet not being homogeneous- and I must say it is interesting to hear the perspective from the inside- Dong is a native Chinese law professor from Kunming. His talk was on Chinese censorship and how the internet might not be universal across cultures. You can view the webcast here. This is especially useful to me, in light of my upcoming lecture at UC Berkeley on "Chinese Law, ICTs and Entrepreneurship." (UPDATE: 4/7/10: Donnie clarifies that he is not advocating for an isolated 'Chinese internet' but that rather, "What I want to argue is simple: the social structure and social norms, as well as the legal concepts may affect online ecology profoundly, hence the "single" Internet is not a truth..." Read more at his Blawgdog post. From 2003-9, there was more and more legal enforcement. The switch from tech to law has increased certainty because the authorities can explain why sites are being shut down. It has also caused important discussions to occur. But, the law is immature and thus enforcement is somewhat arbitrary. And the “clouds of licensing systems” are still difficult to navigate. Q to Donnie: How does the censorship look from the inside? A from Donnie: As Rebecca MacKinnon said, most of the citizens don’t feel the censorship. There’s so much information available, so much news, so many services, so many forums. And if you really want to get some information, you can find a way to. And if you really want to express something, you can. The filtering mechanism can’t work perfectly, and their are many examples of this. 4th #ICT4D Twitter Chat- Social Networking for Developing World? Social networking is driving ICT adoption, but which tools, why, and to what extent? How can social networking increase donor, implementer, recipient participation in development? What are the gaps and limitations in social networking engagement - where doesn't it work? What social networking technology is involved? 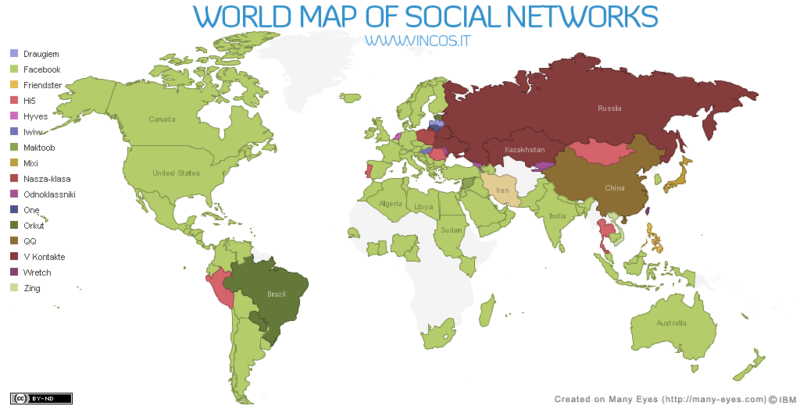 Vincenzo Cosenza recently published a map reinforcing the dominance of Facebook as a powerhouse in the social networking world. And with new features like Facebook Zero, its also changing the way people interact with the Internet. While Facebook is the major player in social networking, more local and regional sites like Mixi and Hi5 also have a presence in the Global South. Many others are being rapidly launched, even using other platforms, such as SMS. In fact, on Twitter, 50% of tweets are not in English. Older technology tools like email can be used to connect and communicate with existing social networks. Still, the idea of the social networking site as a stand-alone platform has undeniably taken hold in the developing world - 25% of Kenyans who are online do not have email addresses yet 80% of all Kenyan Internet users are on Facebook. Not surprisingly, this month's roundtable seemed to reach a consensus around the value of social networking for international development work. Social networking has tremendous potential to give voice to the people on the "receiving" end of international assistance. It's also helping implementers in the actual work of development. Organizations are using different social networks for different purposes - Facebook is seen as a great for public outreach and youth engagement, while Twitter is better for peer exchange and identifying new partnerships. This is one reason that ICTworks has a Facebook empowerment strategy. The largest constraint on social networking's influence and reach is the limited Internet infrastructure of the Global South. Communities that are not online do not feel the impact. In addition, socio-economic barriers like literacy and education can limit adoption and growth in connected societies. Also be warned that big numbers of Facebook or Twitter followers doesn't directly translate into meaningful interactions. In fact, during the #ICT4D Twitter Chat, we came across one group that's steadfastly held its own against the social media tide: the "big men" of Africa - ministers and other government decision makers. There is a still a strong culture among government leaders that "big men" don't use computers. The feeling that typing is for clerks or students. However, even if government officials are not using Facebook or Twitter professionally, they may be online in their personal life. Regardless of personal status, they are listening to what their employees, direct reports, and family hear though online social networks. After all, they're "big men" because of their skill in reading offline social networks. Social networking technology is disruptive - no longer are donors and "big men" in government the only voices that communities have; those parties can be bypassed directly to launch grassroots movements. Indeed, many government and NGO leaders are reluctant, unable, or unwilling to use technology and are in fact being "leapfrogged" by the people they serve. As today's youth who are growing up aware of social networking technology (even in the developing world) become the leaders and decision-makers of tomorrow, the role of global communication in "mainstream" international development will grow even more rapidly. The fast-paced spread and dropping costs of mobile technology will only feed the fire.